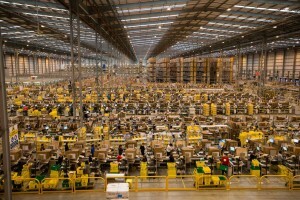 Ecommerce Headline @ Amazon to Focus India as World’s Biggest eCommerce Market Outside the U.S.
Amazon to Focus India as World’s Biggest eCommerce Market Outside the U.S.
E-commerce is rapidly booming in the India with triple digit in 2015-2016 growth as mentioned in a recent study by Chitrangana.com, India’s leading ecommerce consulting company. Amazon, the world’s largest biggest eCommerce retailer, has decided to invest as much as $5 billion in India to turn Amazon.in into its biggest market outside the U.S., An report by Economic Times newspaper. The report by Economic Times mentioned, The additional funds will be invested to grown warehouses network, server data centers and build more deep country wide supplier network. The company aims to provide better services to consumers over it’s domestic rivals like Flipkart and other growing similar marketplaces. The Amazon CEO and Founder Jeff Bezos said , the online giant’s Indian arm had already exceeded expectations, hosting, at the time, over 17 million products on its platform. “After our first year in business, the response from customers and small and medium-sized businesses in India has far surpassed our expectations,” he said. India is highly potential country for eCommerce as followed past trend in offline retail and the growth will be continue minimum by 65% YoY , which may be boost by triple digit till 2020. The growth of population, demand of consumers and geographical distribution creates a big market for eCommerce. The boost of per capital income, increase in average salaries and imense growth of mobile and internet reach has added another growth rocket for the eCommerce indusry, said Director, eCommerce Consultation at Chitrangana.com.